A full tank of espresso and an open mic will put your poetry in motion. Alongside local events that showcase accomplished national writers are the literary scenarios of Salt Lake’s wild side, percolating every night of the week. Now, right here in Salt Lake City, you, too, can hobnob with poets laureate and Pulitzer Prize-winning poets at events like Westminster College’s Anne Newman-Sutton Weeks reading series, then the next night, hang with the local talent at places like Alchemy Café. These nightly venues are where the young and/or passionate, hip and unhip alike, congregate—milling in, getting charged on espresso, embracing their laptops, strategizing over spilled words on pages for the upcoming open mic or slam that night. Each night of the week has its own brand of literary action, whether it’s funked-up with electric guitar, saturated by local art or ignited with political rants. Poets tend to lead the way at these gatherings. It’s like there’s too much poetry to contain in any one venue or on any one night a week. So you start out Saturday night at jam-packed Baxter’s Coffee, welcomed with a boisterous hello from your host—Shae Sveniker. Shae, longtime host for the Salt City Slam and open mic at Baxter’s Coffee, will start the three rounds of poetry and music rotation. Lots of creative flexibility here—no restrictions on language and/or content. Baxter’s Coffee is where the Salt City National Poetry Slam Team hang out, so you’re bound to get caught up in the energy and inspiration of slamming with the pros. On Sunday, you can chill in the warmth and pleasantries of Greenhouse Effect Coffee. After a tasty teriyaki crepe and a cuppa joe, you’re probably now ready to mosey into the back room. Onstage, you’ll see Cody starting the open mic, but there will be no microphone or PA system here. They like to keep things cozy. Take the stage, plug into music or bask in the spoken word! Monday, head out to the west side to The Mestizo Coffeehouse, owned by the ever-loving Terri Hurst. Steeped in Latino passion, Mestizo is truly a work of love, rich with suave atmosphere, community-activated art projects, vibrant local art and murals, including work by artist-in-resident, award-winning Ruby Chacon. Music open mic takes place on Mondays, a poetry open mic on Wednesdays, and open music jam on Fridays. Save Tuesday for the popular Alchemy Coffeehouse, a favorite of the neighborhood. 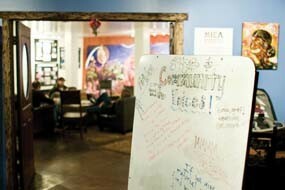 Here, you can get your fill of neighborly love, open-mic music and spoken word. Added perk: the evening’s host records each performance, which you can buy the next week. Wednesday is back to Mestizo for poetry open mic. Thursday happens later in the evening, around 9 p.m., with this newcomer to open mics: Salt Lake Coffee Break. Roomy, with plush couches, walls plastered with art and local event notices and posters, their outdoor patio is always happening, even on the coldest nights of winter! Here you’ll find a verbal mix that includes family-friendly poetry and a crowd that includes out-of-towners looking for some poetic sweetener with their java. Before you know it, you’re at Ken Sanders Rare Books on Friday night listening to one of the original Merry Pranksters or poet laureate Katharine Coles, surrounded by 100-year-old LDS books and psychedelic posters from the ’60s! Get your dose of metaphors and imagery. Throw in live music, poetry slams (where audience members judge performing poets—good, bad or indifferent. Finally, you’re in control!). Toss in some cultural flavor, east-side vs. west-side attitude, conservative vs. X-rated, and you have the wild child of Utah’s burgeoning literary scene. To stay in touch with what’s happening every night, or to add your own ideas/notices go to SaltCityIndieArts.com, or request to be on the e-mail list by writing to Michael Dimitri at SaltCityIndieArts@gmail.com. Just like spurts of caffeine, some of these establishments are here one month, gone the next; but they never die. They just move over to the next coffee shop, until it, too, is evicted to make way for high-rise condos. Most of Salt Lake’s literary venues, to their credit, have been running for years, like the City Art’s monthly reading series at the City Library. All of them are worth a try until you find your own groove, yell at the slam judges, hang in the corner with a napkin and pen, and create your own piece of work to read at the next open mic! Jean C. Howard is an award-winning video and performance poet; organizer, producer and participant in the original development of the internationally acclaimed Poetry Slam. She has poetry published in more than 70 publications. Michael Dimitri has “a fiery passion for arts and community,” according to Shae Sveniker in a Gavin’s Underground interview. He works tirelessly to promote open-mic events around the city. Monday: Mestizo Coffeehouse, 631 W. North Temple, Suite 700, 596-0500, MestizoCoffeehouse.com, music 8-10 p.m.
Tuesday: Alchemy Café, 390 E. 1700 South, 322-0735, Alchemycoffee.com, music 7-9 p.m.
Also Café Marmalade, 361 N. 300 West, 746-2884, poetry 9-11 p.m.
Wednesday: The Mestizo Coffeehouse, (address above) poetry 8-10 p.m.
Thursday: Salt Lake Coffee Break, 430 E. 400 South, 355-4244, poetry 9-11 p.m.
Friday: Baxter’s Coffee, 1615 S. State, 486-0440, music features 7-9 p.m.
Also Ken Sanders Rare Books, 268 S. 200 East, 521-3819, KenSandersRareBooks.com, featured writers, 7 p.m.
Saturday: Baxter’s Coffee (address above) poetry and music, 8:30-11 p.m.
Sunday: Greenhouse Effect Coffee, 3231 S. 900 East, 486-0440, poetry and music, 8-10 p.m.
• The University of Utah: graduate programs in creative writing, literary magazines Western Humanities Review and Quarterly West and faculty that includes Utah Poet Laureate Katharine Coles and poets Jacqueline Osherow, Paisley Rekdal, and Karen Brennan and fiction authors Melanie Rae Thon, Francois Camoin, and Lance Olsen. • The U. and Salt Lake City Arts Council also sponsor the Guest Writer Series at the Art Barn/Finch Lane Gallery (1325 E. 100 South). • Westminster College poet and professor Natasha Saje heads up the Anne Newman-Sutton Weeks reading series. Westminster also produces Ellipsis literary magazine. • June 22-26, 2009, brings the Writers@Work (WritersAtWork.org) writing conference, taking place in 2009 in Park City. • Save Oct. 21-25, 2009 for the Utah Humanities Book Festival at the Salt Lake City Main Library (210 E. 400 South), sponsored by the Utah Humanities Council (UtahHumanities.org). • City Art reading series (SLCityArt.org) provides a venue for writers to read their work, usually at the Main Library on the first three Wednesdays of the month during the school year. • Local bookstores The King’s English (1511 S. 1500 East), Sam Weller’s Zion Bookstore (254 S. Main), Ken Sanders’ Rare Books (268 S. 200 East) sell books, new and used; host author readings, performances, art shows; and in general keep the flame alive.